Rothenburg ob der Tauber is an old Bavarian city, situated along the Romantic Road, or “Der Romantische Strasse”. I rode past, and missed it, in 2016. A visit was not a part of the “plans” this year, originally. Since i’d been advised by BMW not to go through Switzerland after repairs, a decision about direction had to be made, at one point. It was high time for a decision, since beyond Eltz Castle I had absolutely nothing planned. Some might get frustrated by lack of plans, for me that’s more an opportunity, a substantial part of being on an adventure. Take things as they come, make ad-hoc decisions on impulses. June 29th the route shifted southeast. Left Parkhotel “Krähennest” (nice hotel!, has swimming pool too!) after a really good breakfast. Riding further southwest seemed pointless, as I wasn’t going to west Switzerland and France after all. Crossed Mosel valley and river, in direction of the Rhine river, then along the small road L207. Turned out to be a very cool, narrow, twisty road, with lots of surprises. Riding through hills and woods the interest for a more offroad detour grew quickly. This was supposed to be an adventure after all! Coming down on the other side of one hill saw a forest road with an open gate in a sharp turn. Hadn’t been off pavement since Denmark. On impulse I took off into the woods. The “road” morphed into more of a trail than a road, with soft dirt and lots of fallen branches all over. 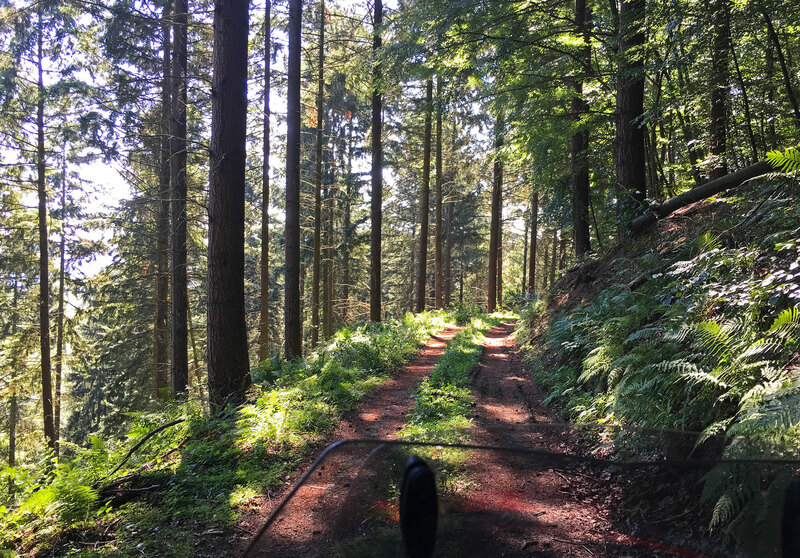 I rode carefully through a gorge, up a winding road along a hillside. Kept on for a little while and stopped at a glen where the road split into two. I had passed an open gate, but for how long would it be open? The deeper into the woods I came the more the fear of returning to a locked gated lurked in my mind. Checked it when riding through, not a chance in hell I’d get past if someone locked it. Regulations are fairly strict in Germany when it comes to offroad riding. Lots of roads are, like home, barred with gates. But with more warning signs. Had not seen on by this gate. But good local knowledge is a requisite, I knew nothing about the area. Could gamble, keep on and hope to find an exit that was open. Or risk finding a closed one. Decided to make a u-turn and went back the same way. 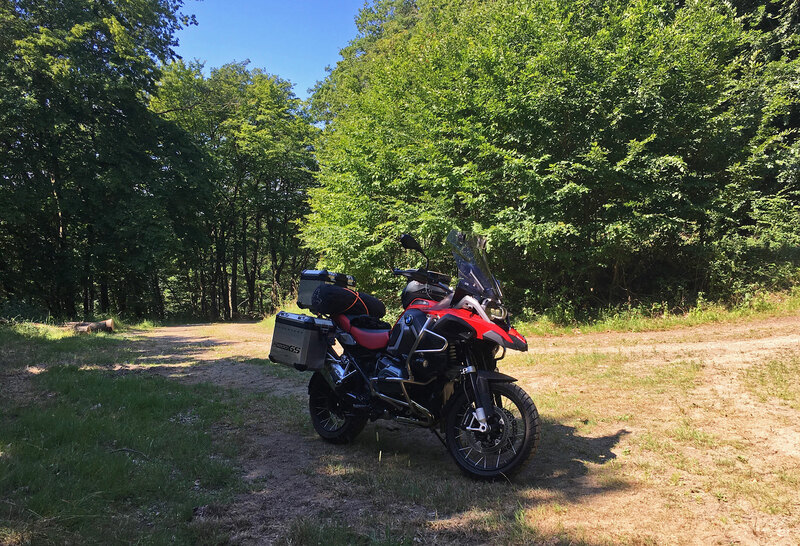 A bit chicken maybe but when you’re riding a large, heavy, fully loaded adventure motorcycle, alone and offroad, there’s a sensible limit to how far it’s worth stretching it. Out of the woods I kept going along the Rhine river, along small roads and through small cities, like Rhens. 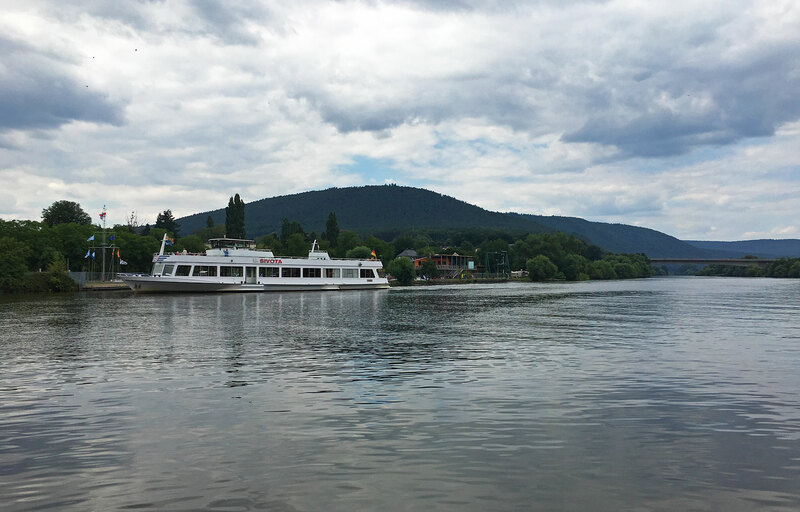 To cross the river I had to ride back up south of Koblenz. Basically the same way came the day before. Across the river I turned east, then continued southeast. Trying to avoid the bigger cities in the region, like Frankfurt, meant staying on local roads. It also meant spending more time. I had no desire to get on the freeway or, for that matter, the larger BundesStrasse. Needed to make a decision about where to go but stalled it for a little while longer. South of Frankfurt I passed through the outer part of Darmstadt, north in direction of Seligenstadt, then followed the river Main southeast past Aschaffenburg. So the front wheel seemed to want to make a decision, even if I couldn’t! A quick coffee & lunch stop at a gas station considered route alternatives. What would be cool to do? Switzerland & France was out. Austria and South Tirol made sense, even if I’d been there before. The direction would mean riding parts of the route I took back in 2016. Not at all a bad option. 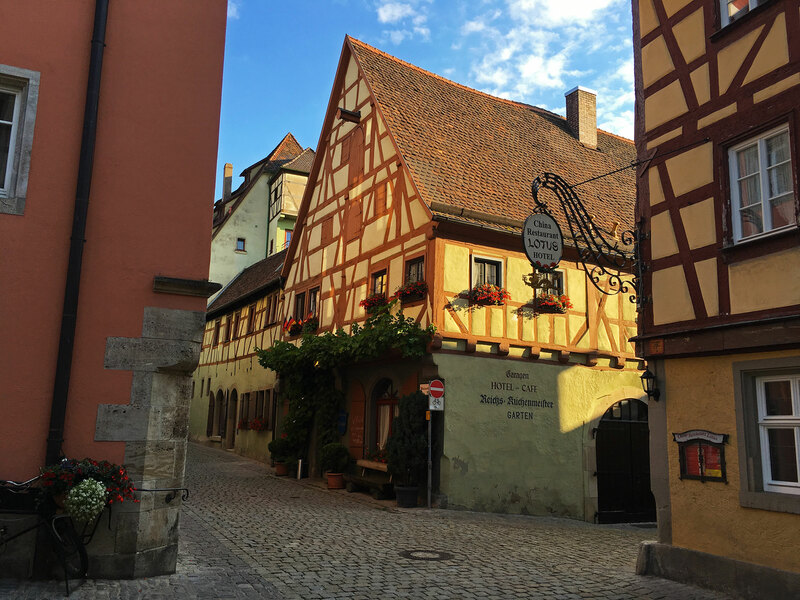 I then considered Rothenburg ob den Tauber, a city I’d missed while traveling along the Romantic road from Wurzburg in 2016. Hmm yeah, sounded like a good idea. 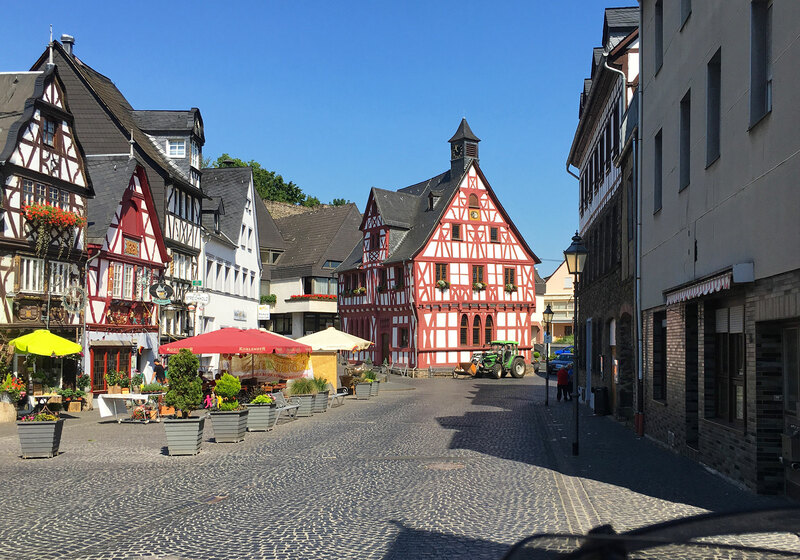 Plonked Rothenburg into the GPS, kept it in curvy roads mode and continued southeast on “smallways” along river Main to Miltenberg. Stopped to check booking options, seemed ok, made a hotel choice and steered forth. 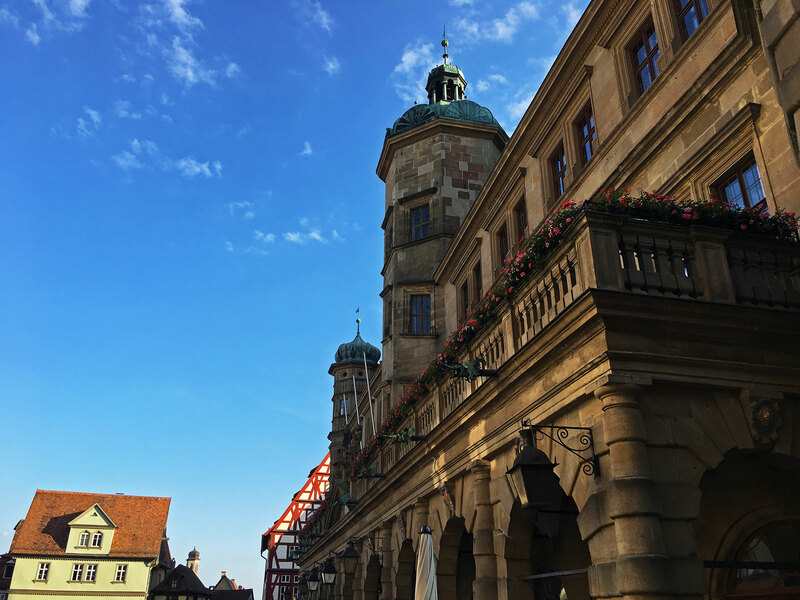 Continuing southeast of Wurzburg (where I had a needed stop in 2016) cut through in direction of the Romantic road. But as following that route would mean north I stayed on the curvy roads approach and away from cities. Time kept, as usual when one is having fun, flying by. South enough I turned east and rode through farmlands, across hills, through woods in direction of Rothenburg. Weather was great, and traffic along the small roads next to nothing. 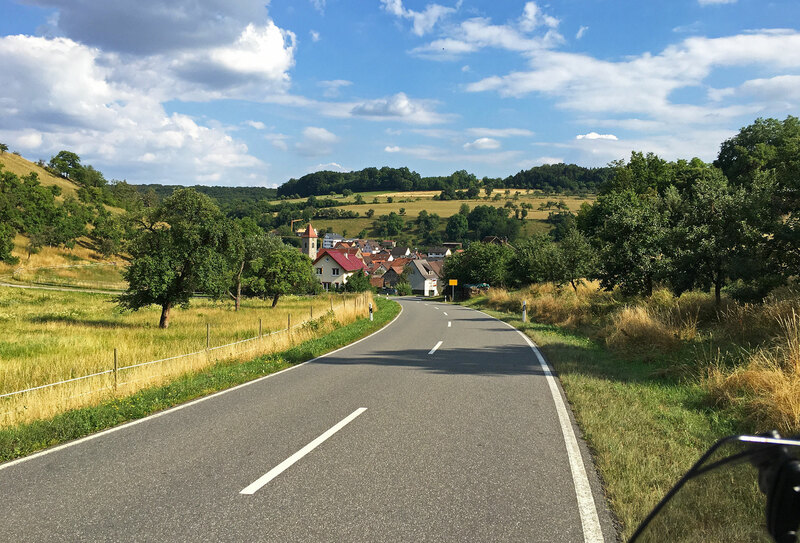 Good tip if you want to travel adventure style, stay off autobahn and and even Bundesstrasse. Afternoon morphed into early evening as I neared Rothenburg . 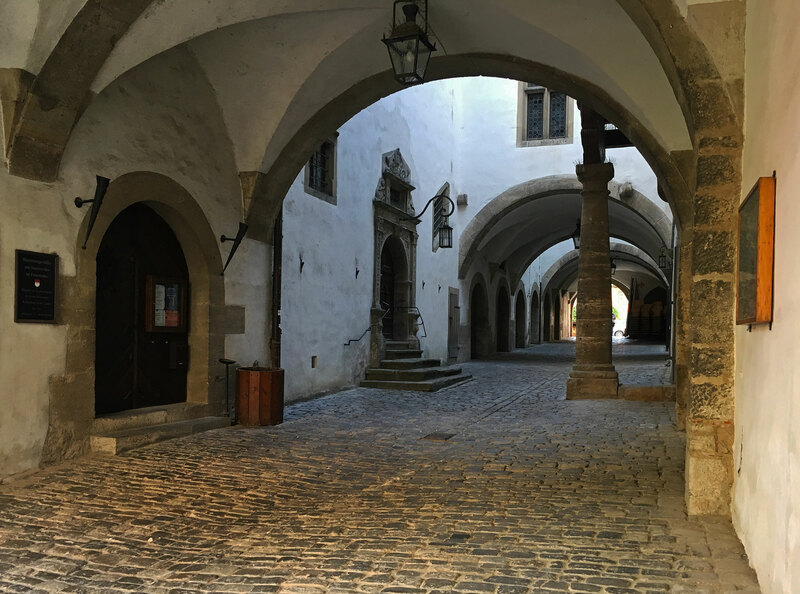 The old city of Rothenburg can be entered through a number of gates. I went through Klingentorbastei, or the northern gate. 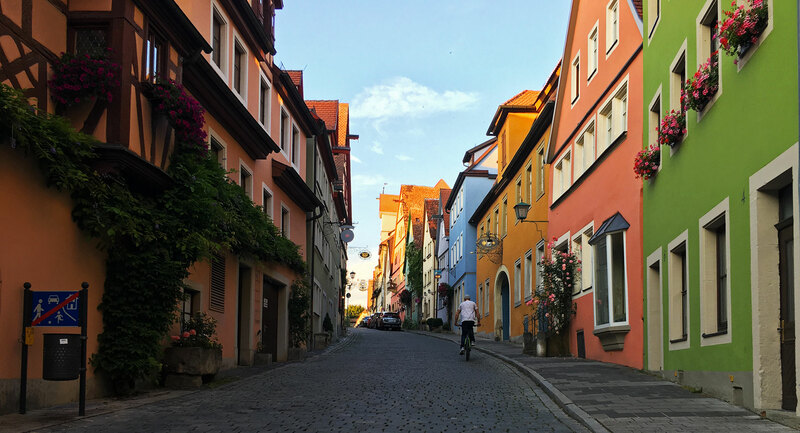 Rode calmly on narrow cobblestone streets down to the hotel, which the GPS found with ease. Had wanted to stay in the old city, just a few minutes walk from the old town’s square. Hotel Am weissen Turm, with an italian cafè/restaurant on the ground floor. Booking.com served up a decent suggestion. No single room so I got a double. It was not bad at all! A quick shower, on with shorts, a T-shirt, and sandals. Then out to trot in the old town. 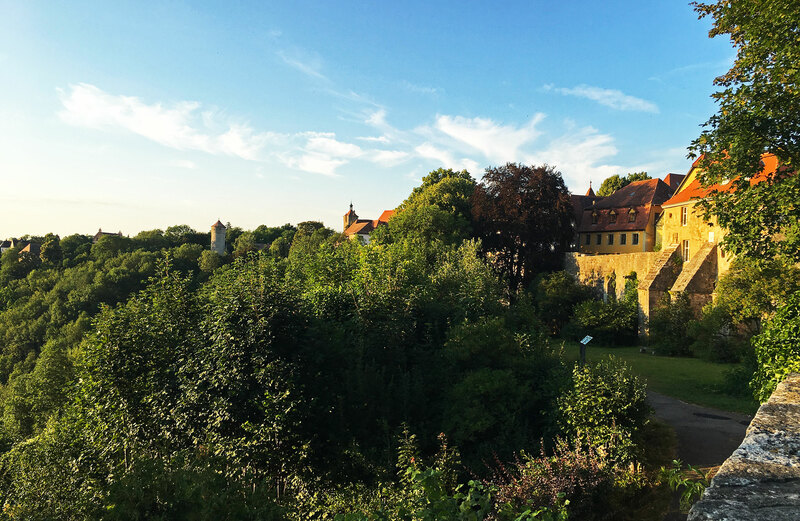 The name, in English “Red fortress above the Tauber”, comes from red bricks on the roofs. The town is located on a plateau overlooking the Tauber River. Old cities from the medieval period are often fortresses, with several walls around them. Rothenburg is one such town. The name also has other properties and references you can read more about on wiki. 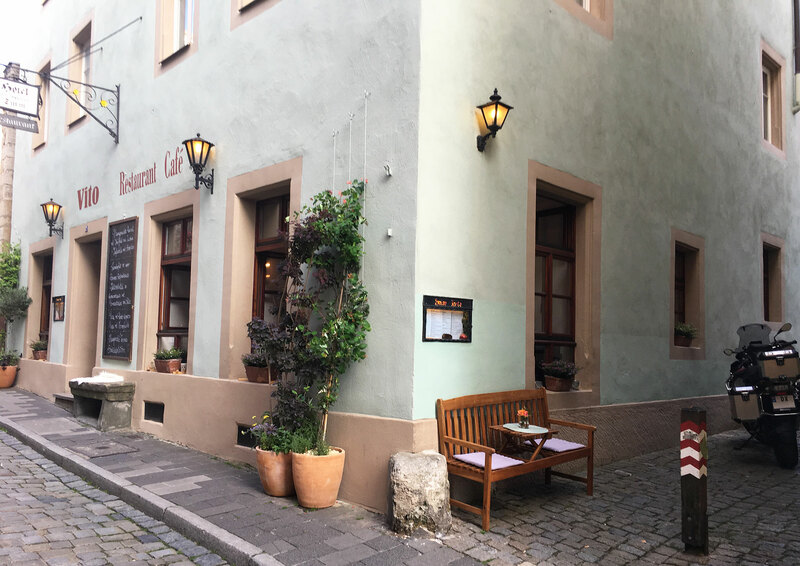 It’s absolutely worth a visit, with its narrow cobblestone streets, it’s many architectural gems and well kept old buildings. In this town you have to comply with sign standard, regardless of business. Plenty of cozy restaurants cafès and pubs to chill out in warm evenings. Some with tables out in narrow streets, some with their own beer garden. The old city has great atmosphere that tidal waves of tourists cannot diminish. If you walk around in the evening, away from the most touristy places, chances are you’ll find some peace and quiet. 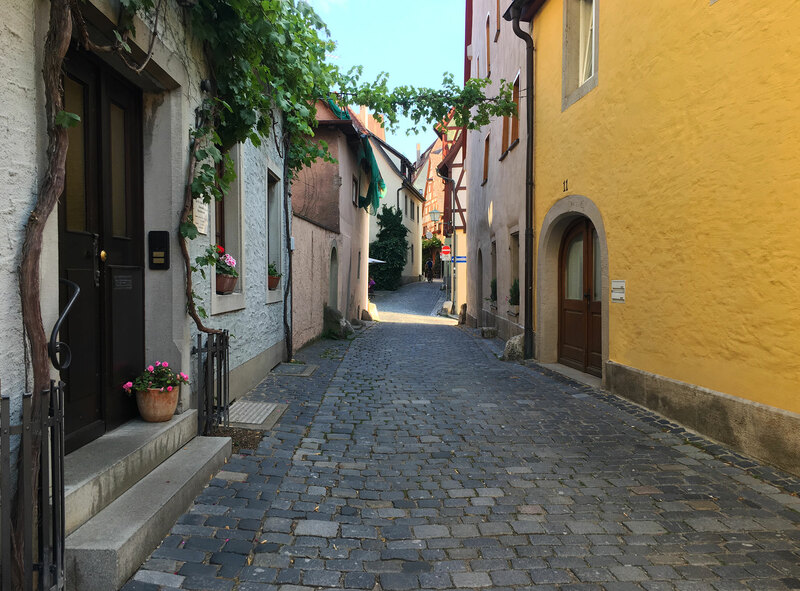 Another typical Rothenburg cobblestone street, a little bit out of the town center. But that was for later, hungry I settled down on the Marktplatz, or main city square, for a bite and beer. The temperature sat pleasantly below 30C, weather was great so a perfect afternoon. 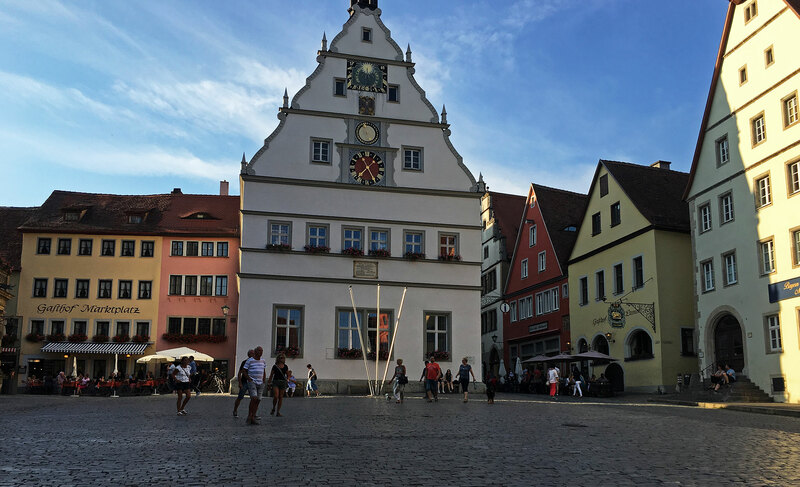 Rothenburg Town hall, at the Marktplatz or main city square. This is my kind of vacation! Good local food, good local beers and drinks. I usually ask for something local, wherever I am. In Germany that usually means tasty, if not very healthy food. But I wasn’t going to let that stop the enjoyment, fasting and “repent” would come later in the year! Having spent the usual 10+ hours on the bike, it felt good to use other muscles after dinner. So I walked around in the old town to explore for a good hour and a half, before returning to the hotel. The next leg, where to? Again, as the day before, I had no plans for the following day. Iideas, but no plans. However, Austria and South Tirol made sense. So the next day I would be going in the same direction as i did in 2016, more or less. 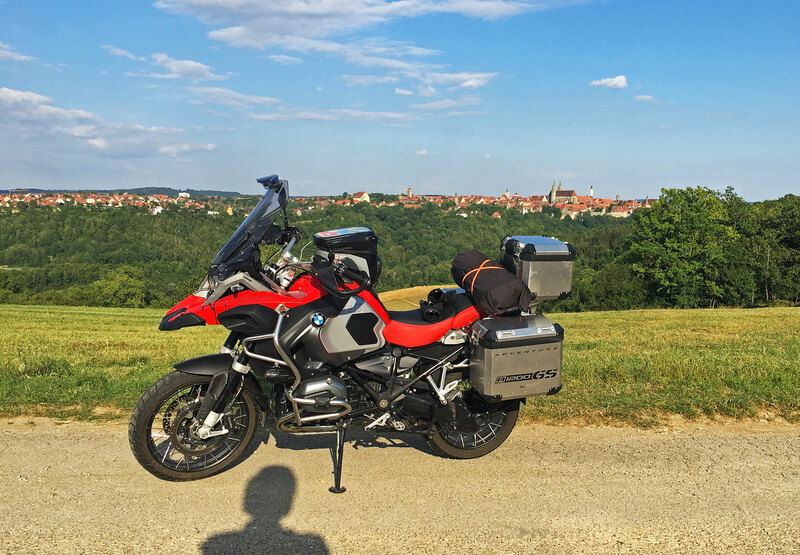 This entry was posted in MC rides, trips & adventures and tagged Adventure, Change, Germany, History, MC riding, Vacation. Bookmark the permalink.